I am writing to publicly express that I am appalled by CTA's official television station's omission of Pawo Phagmo Dhondup's hand-written testament in their video news report from the 8th of May. Till now, over a hundred Tibetans in Tibet have set themselves on fire for freedom. They are the true martyrs of Tibet. If Tibet does not get its freedom and independence, China will annihilate Tibetan culture and tradition. This year, Chinese authorities have restricted studying Tibetan language in our Tibetan areas in Bayen and all teachers have been expelled from the region. I am really sad now. Today on the night of the 15th day of the Tibetan New Year, I will set myself on fire in front of the debating grounds at the Jhakhyung Monastery. Today is Tibetan Independence Day. Phayul's report which came a day after CTA's television reportage also included the entire contents of Pawo Phagmo Dhondup's last words. 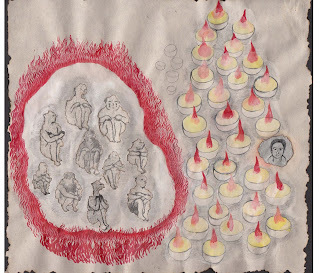 Of the 117 self-Immolations, there are only a handful of known hand-written testaments left by the Tibetan martyrs, all whose contents are either secretly scanned/photographed and sent to us (usually electronically) or conveyed via phone calls to Tibetan media or individuals. If our brethren inside Tibet can sacrifice their lives for the Independence and Freedom of Tibet and return of His Holiness the Dalai Lama, and if their brave friends and family members who despite severe risks of arrest, torture, imprisonment and even death by the Chinese authorities send such materials to us in exile and to people of the free world, then the least we can do for them is give them their dignity and honor their precious sacrifice by making public and amplifying their voices, fully, sincerely and transparently. A mere 35-second summarized reportage which excluded much of our martyr's testament smeared shame on those of us from the government to NGOs to individuals who work in priority for the people of Tibet and the Tibetan freedom struggle. The biggest injustice is when a martyr's last and final wishes for all Tibetans before sacrificing his life for our country is being silenced and muted!